I am a serial returner. I recently learned that there is a condition called Compulsive Buying Disorder (CBD) that affects 5% of the population, and some researchers include the act of returning items as part of CBD. While I don't think my shopping habits are that severe, I do associate with the impulsive and indecisive character traits aligned with it. I often set a budget and then blow it thinking I can make it up in other places. And sometimes, I can. Other times, I go back to my budget spreadsheet and just can't make it add up. Cue returns, spending no money and the anxious wait for the money to hit my account. Yes, it's good that I recognised the error of my ways and took action to correct it, but having a famine and feast attitude when it comes to money isn't really healthy. However, it's not actually our legal right to return something, unless it's faulty. So here's a thought to test how much you really want an item. When you're next out shopping, ask yourself this: "if you knew you couldn't return this, would you still buy it?" 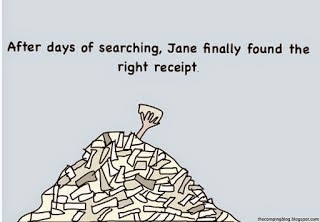 If you had to remove the tag at the till and scupper any thought of a refund, would you feel the same way about it? And if you dig a little deeper, you can ask what the purchase is really about. A bad day? Feeling you're owed a treat? Throwing a tired of being "good" with money tantrum? Shop as though you can't return. The questioning will improve the quality and quantity of your purchases, and elevate the importance of ownership. Weed out all of the crap, unnecessary purchases and make your money do more of what you planned in the first place.